I guess you could call me something of a meat expert. I’ve spent the better part of the last nine months researching meat for my masters dissertation, including countless meals in steakhouses (mostly Argentine) in Australia and the U.S. Well I suppose I’ve been conducting research on this topic most of my life, as I’ve eaten some of the best steak the world has to offer. I grew up eating juicy Midwestern corn-fed beef. I lived in Argentina, where people eat more meat per capita than any other country, and ate beef pretty much every single day. Feasting on flavorful grass-fed Argentine beef slow-grilled at a family asado is an experience not to be missed by meat-lovers. 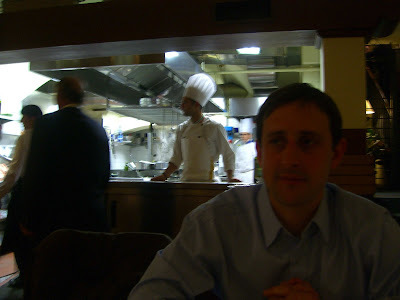 My twenty-fourth birthday present was a visit to one of the finer steakhouses in Kobe, Japan, where Phil treated me to buttery, refined Kobe beef steaks. And Boston certainly has its fair share of high-end steakhouses like Grill 23 or Smith & Wollensky that serve the best meat money can buy. My recent trip to Florence certainly added another steak to this short list of the best beef experiences in the world. 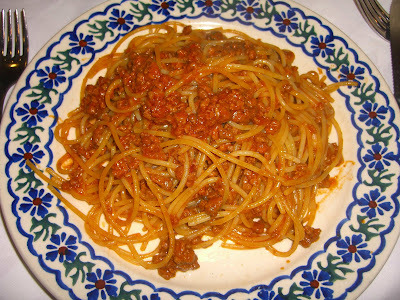 Our first night in Tuscany, we dined at Buca Lapi, the oldest restaurant in Firenze. 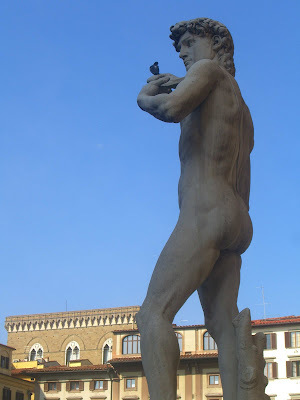 The eatery is located in the frescoed basement of a palazzo located between the Duomo and Santa Maria Novella. Many reviews I’d read online claimed that this was THE place to have bistecca alla fiorentina, and when our friendly hotel owner confirmed that Buca Lapi had one of the best steaks in town, we headed there immediately. We started with a wild boar salame on a bed of arugula. 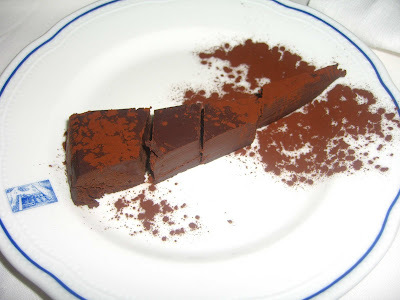 Wild boar, or cinghiale, is everywhere in Tuscany – more on that in a later post. But we came for the steak, and oh boy, did we get the steak. 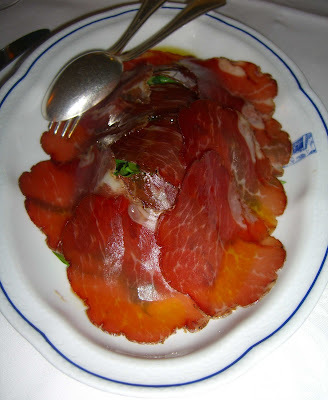 Buca Lapi has an open kitchen where you can watch hunky Italian chefs cut huge hunks of beef from the famed Chianina cattle, cook them to order over a charcoal grill, and sprinkle them with Tuscan olive oil and salt and pepper. 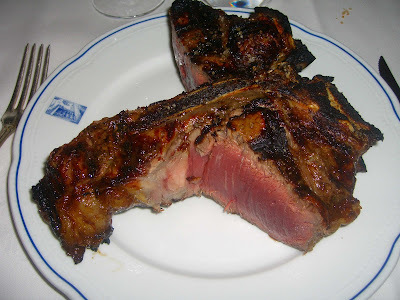 The bistecca alla fiorentina is a thick porterhouse steak and I’d say ours was almost three inches thick and probably weighed three pounds. The chef then brought this massive cut of beef to us and carved it tableside into thirds, so we each got a portion of both the strip and the tenderloin. I spoke up the quickest and got the third of the steak with the bone attached. Score! 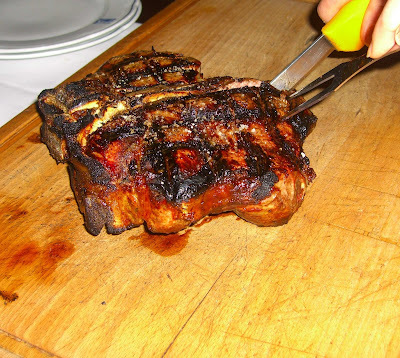 The bistecca was nicely charred on the outside and very rare but hot all the way through. A good amount of fat was left on the steak, keeping it juicy and flavorful. 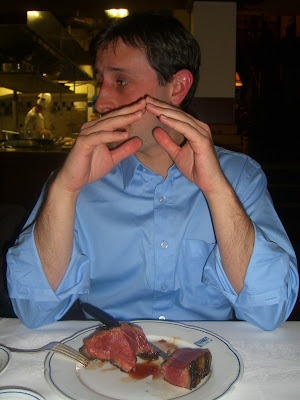 I think Phil’s expression says it all – he took one bite, put down his fork and knife, sat back in his chair, and spent a moment reflecting on the best steak he’d ever eaten before digging in again. We took turns gnawing on the bone and got stares from some of the more refined patrons of the restaurant… but hey, I think there were drugs in that steak, we were in a crazed meat frenzy and couldn’t get enough! 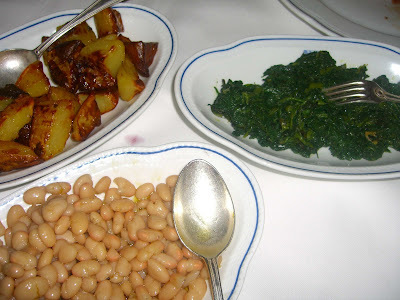 We chose traditional Tuscan sides of sauteed spinach, white beans with olive oil, and roasted potatoes. 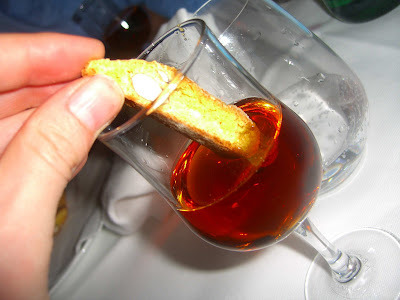 …and little crunchy almond biscotti called cantuccini, dipped in small glasses of sweet vin santo wine. 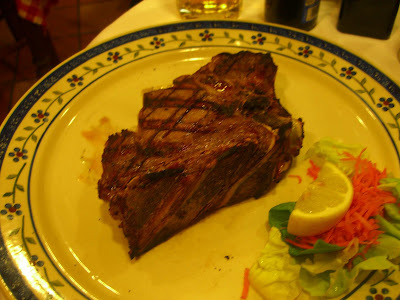 We also enjoyed traditional Tuscan fare, including the famed bistecca alla fiorentina, at Trattoria Marione. We happened upon this place on one of our first days when we were in the area around Santa Maria Novella and liked it so much that we went back a couple days later. The place always seemed to be bustling. The major draws were the tasty local fare, hearty portions, and extremely reasonable prices. We ordered a lot of food and sampled off of each other’s plates. 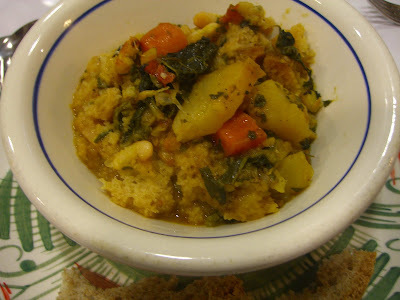 My favorite starter was the ribollita, a thick Tuscan stew made of leftover bread, cannellini beans, and vegetables such as carrots, potatoes, cavolo nero (Tuscan kale), and onion. Ribollita literally means “re-boiled” owing to the stew being prepared one day, allowed to sit overnight so the bread soaks the rich broth and the flavors meld, and re-warmed and soaked with olive oil the following day before serving. 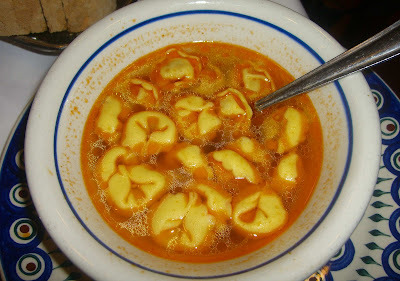 We also tried the tortellini in brodo, cheese-filled pasta packages floating in chicken broth. Simple but perfect. The stand-out main at Trattoria Marione was undoubtedly the lasagna. 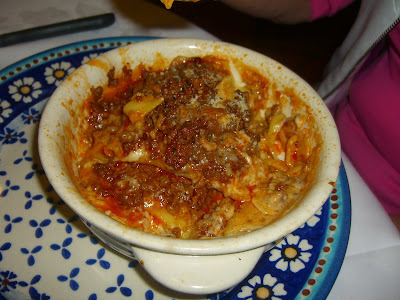 Wow – definitely the best lasagna I have ever had. Each lasagna was individually layered in its own dish with fresh pasta squares, creamy béchamel, beef ragu, and mozzarella, then baked until brown and bubbly. If you go to Tuscany, you MUST go to Florence, you MUST go to Trattoria Marione, and you MUST order this lasagna!!! 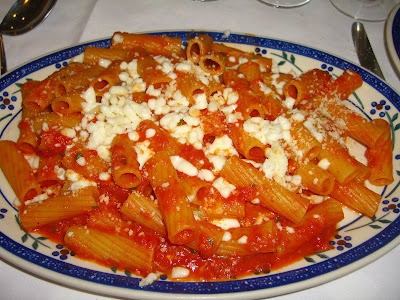 … and rigatoni with pomodoro, basilica, and crumbled fresh mozzarella (simple and light). 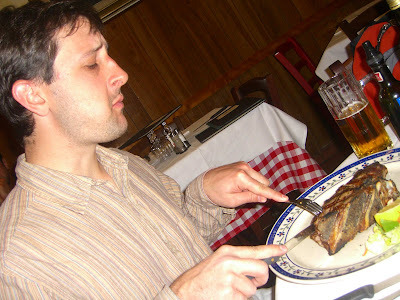 Phil ordered the bistecca alla fiorentina on our second visit to the trattoria. It’s unfair to compare any other steak to Buca Lapi’s hunk of cow, and this certainly wasn’t of that standard (neither was its pricetag, at half of the Buca Lapi price). It was very very very rare – rareisimo? – to the point of being cold on the inside, and much more chewy, but very flavorful and “beefy” tasting. Phil certainly wasn’t complaining about this one, either. i have seen yours wedding photos! I'm happy you love italian food! excuse me for me english! That steak looks and sounds friggin unbelievable! Am so jealous Cari!